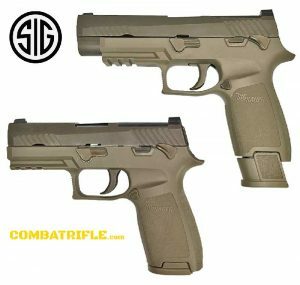 SIG Sauer has announced its Model P320 will be replacing the U.S. Army’s use of the Beretta M9 service pistol. The Beretta M9 has been used since the mid-1980s. The SIG Sauer P320 was chosen over a long list of modular handguns, including the Beretta APX, Glock 17 Gen4 and 22 Gen4, Smith & Wesson M&P, Springfield Armory XDM and Taurus PT24/7 OSS. SIG’s P320 was released in 2014. It is a polymer striker-fired pistol and is the first modular pistol with interchangeable grip modules that can also adjust in frame size and caliber. The Modular Handgun System (MHS) Program in New Hampshire provides both full size and compact P320 pistols over a period of 10 years. All pistols will be configurable to receive silencers and include standard and extended capacity mags.